Bucks County, PA is famous as one of the northeast's best places to live. From New Hope's Victorian splendor to Bristol's heavy industry, we have something for everyone. Shop 'til you drop at the Oxford Valley Mall. Relax and explore history at Washington Crossing State Park. Photograph our gorgeous covered bridges and take home world-class original art. Eat, learn, enjoy, and grow -- Bucks County is a place for families. 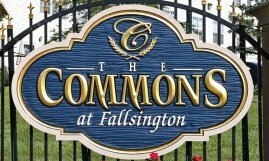 The Commons at Fallsington offers you Bucks County apartments for rent in Morrisville, PA. Part of the terrific Pennsbury School District, Morrisville brings you Bucks County's best while putting New Jersey at your fingertips. Trenton's museums and attractions are a quick skip across the river, while New York and Philadelphia are within easy reach. Consider The Commons at Fallsington, quality Bucks County, PA apartments. Ask us for more information on living in Bucks County, PA.